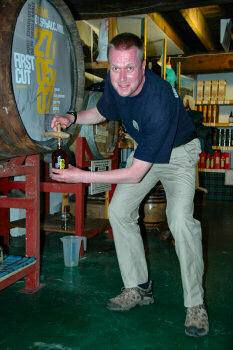 Filling a bottle of Islay Single Malt Whisky yourself is a special treat if you like your Islay malts. I filled my first bottle back in 2003 when I gave myself a birthday present at Bruichladdich distillery. This year my parents were responsible for this treat and a belated birthday present. The last time only a few distillery employees witnessed the event as far as I can remember (and took the pictures). This year my parents watched, my sister took the pictures and I believe another visitor even videoed the event, unfortunately I didn't get around to ask them if I can get a copy. While some people are keeping the bottles and I also hear that some of the early valinches now trade for £500, I believe whisky is there to be drunk. Obviously a special whisky requires a special occasion, but you can always find that special occasion. I don't know yet when and for which occasion I will open the Port Charlotte First Cut, but I do know for which occasion I opened the Octomore Birth: I opened it for the long distance dram I had with my parents when celebrating a new job. I'm also drinking it now while writing this blog entry, a too good opportunity to miss and I think it fits very well now. But back to the Port Charlotte/ First Cut. My bottle is No 817 out of an expected 950, in other words there must be more than 800 people out there who have filled their own bottle of it. One I found has written about it in his blog as well recently: Bill Penn filled bottled No 654 in early June 2007. Judging from that I would guess that the cask must be empty by now or will be very very soon. I don't know if anyone from Bruichladdich or anyone who has recently been at Bruichladdich is reading this (I hope someone is! ), if you do and know the status please leave a note in the comments.